Zhuo Chang, a PhD student from the School of Engineering, has been awarded the prestigious Chinese Government Scholarship for Outstanding PhD Thesis for Self-Funded Students 2018. 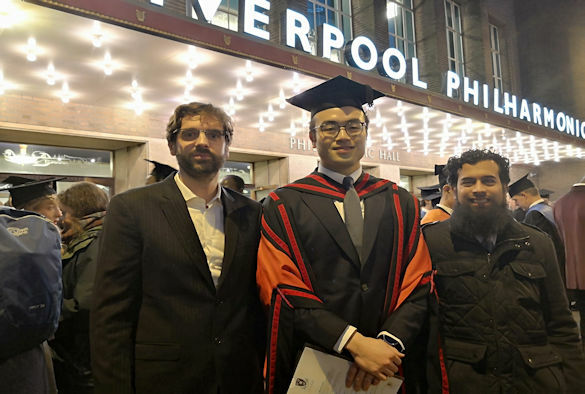 Zhuo was one of only eight students from the North West to receive this award and will receive $6,000 USD and a certificate in recognition of his academic performance and outcome during their PhD (e.g. papers, conferences, research subject and thesis etc). Zhuo’s PhD project focused on developing our fundamental knowledge about how arteries get stiffer with age, which leads to subsequent development of cardiovascular disease. He was supervised by Dr Riaz Akhtar and Dr Paolo Paoletti. A key finding of Zhuo’s thesis was that the internal mammary artery (which is removed during the surgical procedure carried out for coronary artery bypass operations) can provide an important indication of changes that have occurred in larger arteries such as the aorta hence it can be used as a ‘biomarker’. The project was conducted in collaboration with the University of Southern Denmark and Zhuo also spent one year in Taiwan at NTHU (as part of the Dual PhD programme). The Government Award for Outstanding Self-Financed Students Abroad is an annual program sponsored by the China Scholarship Council, a non-profit agency affiliated with China’s Ministry of Education. The scholarship was founded in 2003 and worldwide recipients are chosen annually based on a record of outstanding accomplishments in any discipline. To date, recipients include students from 34 countries, including United States, United Kingdom, Germany, Japan, Australia and Canada. In addition to the financial prize, the Chinese embassy can assist or provide recommendation for the student to obtain an academic position or related work if the student intends to return to China upon completion of the PhD.